Has your dog been a good dog? If you answered yes, we have what you need…a Jolly Egg by Jolly Pet. 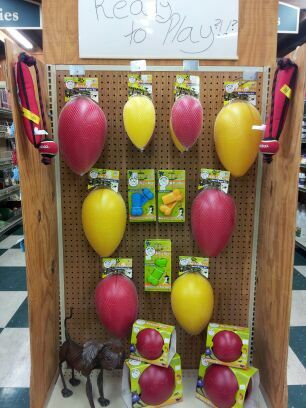 Stop by Lochte Feed & General Store and see the wide selection of pet items to keep your pet happy! This entry was posted on Friday, August 2nd, 2013 at 11:18 pm	and is filed under News & Updates. You can follow any responses to this entry through the RSS 2.0 feed. Both comments and pings are currently closed.